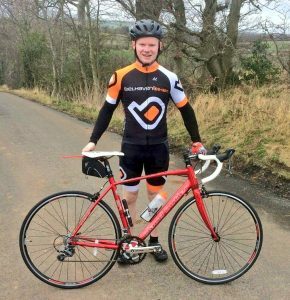 You are here: Home » News » Belhaven Bikes Sponsors Local Lad Lewis! This year we’re proud to sponsor 18 year old Lewis Rollo from Gifford, East Lothian as he makes his mark, as the youngest competitor, on the Pirelli National Superstock 1000 race series which supports the British Superbikes season. Lewis started racing motocross aged 7 then spent a few years racing minimotos scoring wins in the Scottish Championship. He quickly progressed to the 125 Aprilia Superteens and had larger, 4 stroke machines firmly in his sights. 2015 saw Lewis dominate in three Superstock 600 races, including rounds which took place at Scottish tracks, East Fortune and Knockhill. In 2016 he finished 5th in the championship including a few podium spots. This year Lewis’s fitness was more important than ever to handle the powerful 1000 Kawasaki ZX10RR supplied by his team MSS Performance. To enhance and complement his fitness programme we supplied Lewis with a Claud Butler road bike from Tandem Group Cycles, together with the bike’s maintenance and cycling kit. Many thanks to Tandem Group Cycles for helping us to achieve this sponsorship. 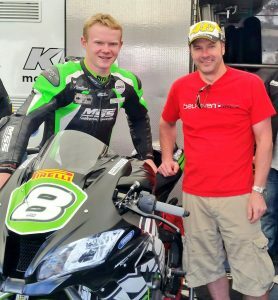 “We’ve watched Lewis racing over the years and taken a keen interest in his progress and successes, it’s a pleasure to help him with his move to the National Superstock 1000 class. “I had a really good weekend at Knockhill. At first we struggled with set up but we kept making changes to make me happier with the bike and going faster. On Sunday I started 14th and battled my way up to 8th getting our first top ten of the season. We had an amazing home round, I’d like to thank my sponsors and everybody that came to say hello and for coming out to support me”.